There are renewed calls for a dramatic shake-up of Australia’s three-tiered system of government, with one state MP saying the country is facing a reckoning. Katter’s Australian Party MP for Mount Isa, Robbie Katter, is one of several parliamentarians pushing for a referendum on the issue of north Queensland breaking away from the rest of the state. Mr Katter said the split was needed to address what he described as a “sinkhole” of funding to “keep building aquariums in Brisbane and office buildings and to buy votes”. “Queensland’s always been agriculture, mining and tourism, you need those things … and a lot of those things exist outside the metropolitan area,” he told Lateline. Mr Katter and many others have told Lateline the problem is nationwide and urgently needs to be addressed. 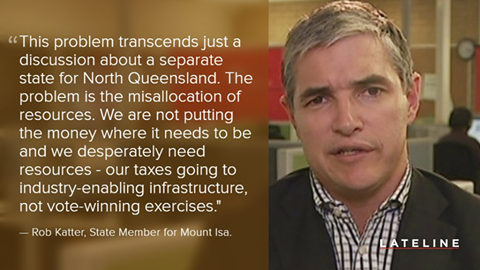 “This problem transcends just a discussion about a separate state for north Queensland. The problem is the misallocation of resources,” Mr Katter said. “There’ll be a reckoning at some point and we’re starting to experience that reckoning, I’d say across Australia. Posted on April 2, 2016, in Farmers, Local News, northern development, Queensland Politics and tagged New State, North Queensland. Bookmark the permalink. Leave a comment.